The Cinch Direct Mount N/W Single Chainring 10-12-Speed from Race Face offers superb chain retention thanks to its narrow wide profiling. The stiff 4mm thick plate is constructed of lightweight, aerospace grade strength 7075-T6 aluminum, which enables load transfer without causing flex. 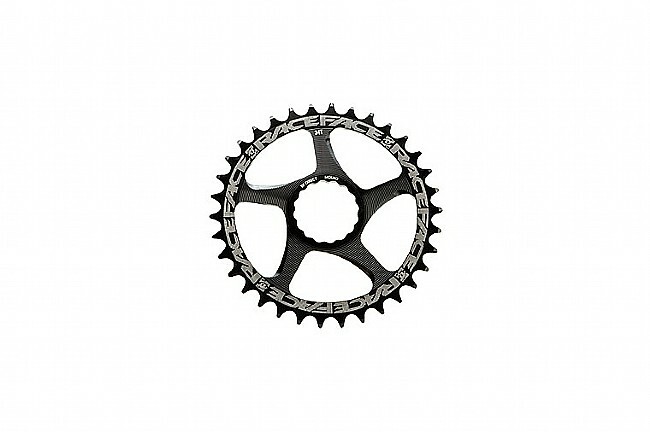 This chainring attaches as a part of the Race Face Cinch System, making it fast and easy to swap between rings and spiders. Light, aerospace grade strength 70750-T6 aluminum. Weight: 33g (24T) - 112g (42T). Compatible with 9-12 speed Race Face cranks with CINCH System Interface. Size: See drown down menu for size options.